The truth is ANYONE can have depression. Many people in the field of mental health have at one time or another experienced having a mental illness of their own. It’s one of the things that helps make therapists empathic. We’ve been down that road; we can understand and at appropriate times we can share our own experiences and strategies for coping. Some mental illnesses can’t be “beat,” sometimes mental illnesses are something the individual has to manage for a lifetime. One can’t “get over it” because the cause of some mental illnesses are chemical imbalances within the brain. We wouldn’t tell a diabetic to “get over” needing to take insulin, so why should we assume that someone with depression would have to stop taking a medication that helps them balance the neurotransmitters in their brain. Why I am telling you this? I’m telling you this because we all need to end the stigma of mental illness. If as a society we are afraid to talk about mental health issues we make it harder and harder for those who need help to reach out for it. It’s a basic instinct to want to feel “normal” … and if we can help normalize mental health problems we can create an atmosphere where individuals are more likely to get professional help and continue their treatments. Rather than feeling “crazy” or “weird” or “weak”. A brave blogger, Andie (Crayon Freckles), had a great idea … for us to band together and share our mental illnesses publicly on our blogs. To share our stories in hope that others will read them and not feel alone. To take a stand and tell the world that it’s okay to talk about this; we NEED to talk about it and support each other. That’s why I’m telling you this. To read my story and for links to other stories in the “Parenting with Mental Illness” blog carnival visit My Depression Story on my blog, PlayDrMom. I completely agree. Anyone can have depression. Even therapists can be depressed. They are only humans. 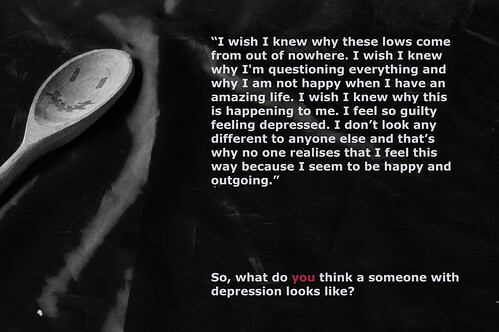 We are all humans and at some point in our lives, we really can feel depression. Depression can be fatal, that’s why it is important to help people with depression. It is important that people with depression talk things out with family and friends. It really helps to go out and spend time with family and friends. Talking really helps.